A black tie event is a formal or semi-formal event such as an evening wedding, award ceremony, gala, charity ball, etc. It is important to know how to dress for such an event since your clothes and appearances can reflect your personality. 1. How to Dress for a Black Tie Event? – How Should Men Dress for a Black Tie Event? – How Should Women Dress for a Black Tie Event? While a black tie event is not as formal as a white tie event, it is more formal than other dress codes. This means that you can’t wear casual or smart casual clothes to a black tie event. However, if the invitation states black tie optional, creative black tie or black tie preferred, you can be more flexible in your attire. 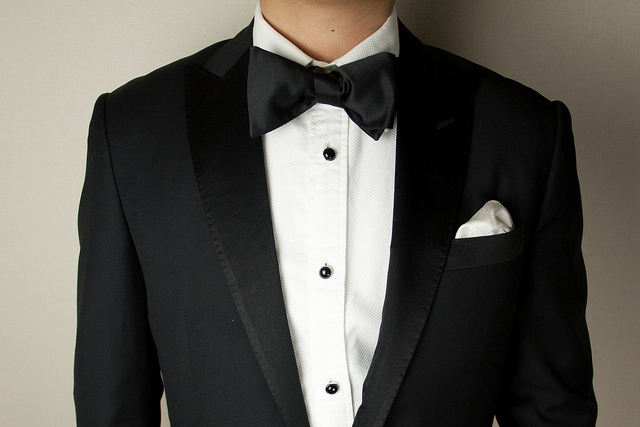 Men should wear tuxedos for black tie events. A tuxedo is a man’s dinner jacket, which is worn for formal or semi-formal events. It should be made of black or midnight blue wool and includes a jacket and matching trousers. Let’s look at these clothes separately to get a clear idea. Jacket: Single-breasted or double-breasted jacket in black or midnight blue, having a peak lapel or shawl collar with satin or grosgrain facings and pockets with no flaps. Trousers: Trousers should be from the same material as the jacket and have a single braid along outside seams. It should be cut for suspenders and have no cuffs. Women’s wear for black tie events is less rigid than men’s wear. The most common and traditional option for black tie events is a floor-length evening dress. These gowns look very formal and elegant. The neckline must be tasteful but the sleeve length of the dress can be varied. Most evening gowns do not have sleeves. Many women choose dark colors such as black, navy blue, maroon, rich purple, etc. since they look more appropriate for evening functions. Mid-length cocktail dresses can also be worn for black tie events, especially if they are in deep dark colors. But cocktail dresses are more appropriate for younger women. Older women often tend to wear floor-length ball gowns. Accessories such as real (real pearl, gold, etc.) or real-looking earrings, bracelets, understated necklace, purse or clutch and gloves can also make women look more elegant. The shoes worn with black tie dresses should be dainty and strappy, but should not have extremely high heels. The easiest way to remember what to wear to a black tie event is to keep in mind that black tie events are formal events and that men wear tuxedos and women wear long evening gowns for them.